My question, how can i do such headings? "#" to get an unique channel name, the value doesn't matter. Example: [cSpacer0]a centered text, [rSpacer1]a right aligned text. Check also the five special spacer: "---,...,-.-,___,--.". How can I do that on my server? Thread Merged. PLease next time use the search function. Last edited by florian_fr40; December 1st, 2011 at 08:22 AM. Channeltitle: How do i do that ? can so explain to me how u creat a channel with the following name ? I just got how u make just a lane full with --- in a spacer but i want the uppon written channel name. Can so tell me how that works ? well tx to this move but thats not what im looking for. Maybe i didnt describe it well so i try again. Id like to have the line to the border of the window so it uses the full width indipendent from the width of the window. it posts "~~~~~~~Welcome~~~~~~~" in the mid but the ~ stops on half way to the borders. and i use the newest server and client version. I made a screenshot and attached it. In the red marked area the ~ is missing, id like to fill the red area too. You can't fill it with words as said above. * can be used for symbols only. Repeating words look ugly. Last edited by dante696; July 10th, 2012 at 01:30 PM. so its just "~~~~~~~Welcome~~~~~~~" this or "--------------------------------------------------------------" this posible ? In that case tx to u for help. Would be great if this was possible. Would fill the space with "--------------------------------------------------------------------------------"
ok but its not possible to put a word in the center of this rows right ? I understand what you are trying to say to these final gentlemen trying to help you. And I think I have the answer to your problem. You are trying to fill the whole line with "--------" and contain the word "Welcome" in the middle? Correct? So like - "----------Welcome-------". And I can positively inform you that there is no such way to fill the whole line. Instead, why not try what I do with my teamspeak servers? And place a spacer with "-------" (so [*spacer0]---) above and below the word welcome which you can centre by typing "[cspacer0]Welcome". 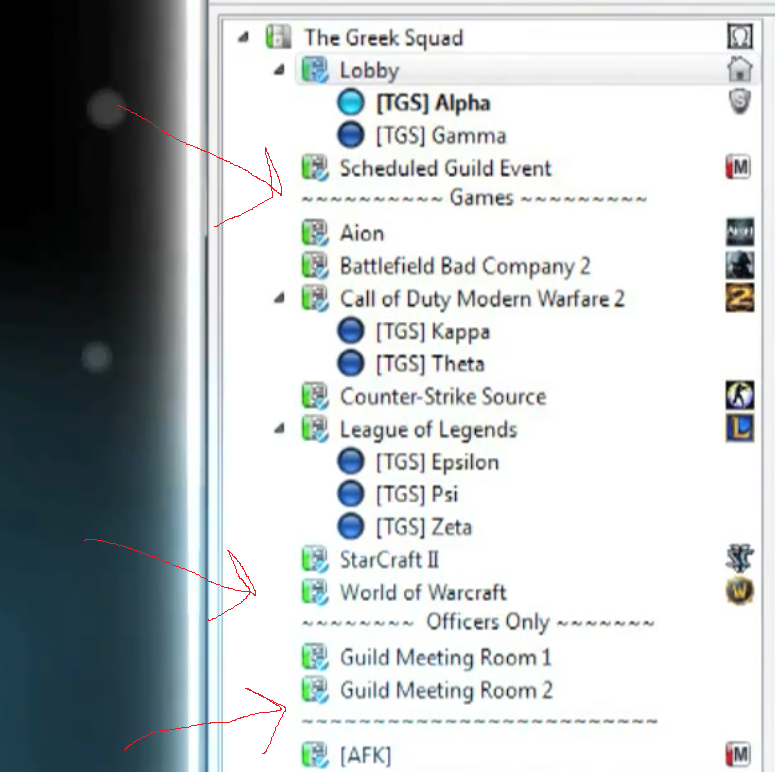 It is a neat and efficient way to seperate areas within your teamspeak. I hope this helped!